This study used a rigorous difference-in-differences approach to examine the effect of child care policy on women's labor force participation. The study examined the effects of state-level spending, copayment rates, and income eligibility thresholds on the probability of employment and labor force participation by potentially eligible women (defined as women below 85% of state median income and with children ages 0 through 12). Data came from three sources that were merged together for the analyses: the Current Population Survey Annual Social and Economic Supplement (2003-2012); CCDF expenditures from ACF-696 data; and CCDF policy parameters from the CCDF State Policies Database (2003-2012). We found that higher spending by states on child care subsidies increased the probability of employment and of labor force participation by potentially eligible women. 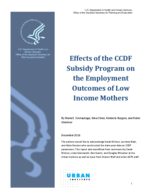 In real terms, if current CCDF expenditures were tripled, the number of women newly employed would be 652,000 (among women below 85 percent of SMI with children ages 0 to 12). Somewhat unexpectedly, higher copayment rates and lower income eligibility thresholds were associated with higher probabilities of labor force participation, though these findings were not robust across subgroups.